The best for baby beets! Choose the beet that has it all! Pablo Hybrid is a gorgeous beet that boasts a richly sweet flavor, fully rounded shape and can be grown in a container garden. 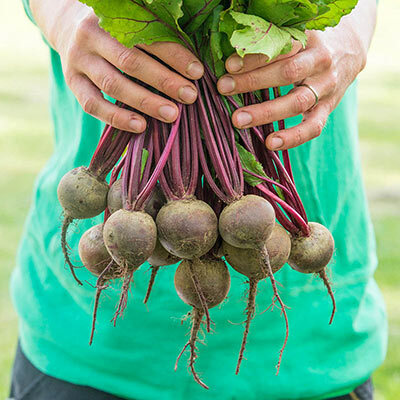 This is a productive variety that matures quickly, but can also be harvested early to be enjoyed as baby beets. Tasty and colorful addition to soups, salads and sandwiches. For best results, grow beet seeds in rich, sandy soil. Can also be sown directly into the garden 30 days prior the last frost of spring. 49 DAYS. Form: Root vegetable with upright foliage. Seed Count: Approximately 200 seeds per packet. Seed Mat has approximately 120 seeds.